New York Comic Con is this week, and if you don’t have your tickets yet, well, I’m sorry to hear that. It’s going to be a huge event (as it usually is), but this year is super special. 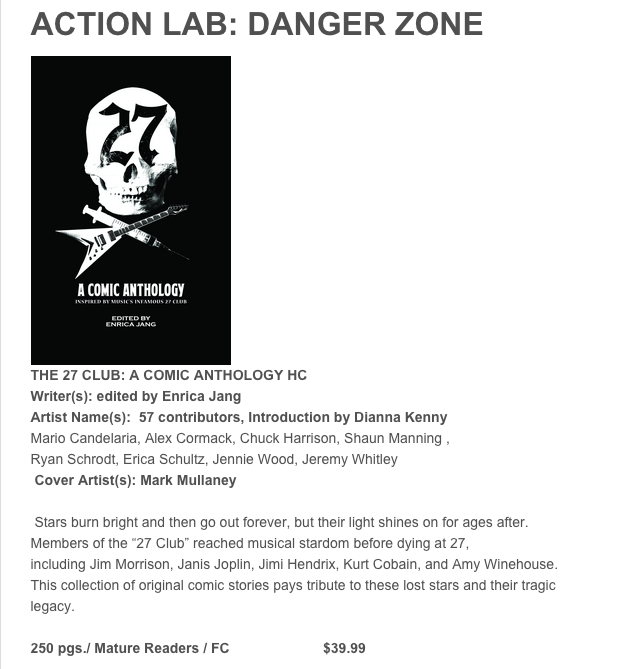 For The 27 Club: A Comic Anthology, a rocking crew of fifty-four comic artists and writers were challenged to take their favorite song or member of the 27 Club and use their music as inspiration for new and original comic stories and vignettes. This collection is a rocking tribute to a select few of these lost stars and their shining, tragic legacy. Edited by Enrica Jang, with introduction by Dianna Kenny. Who are some of the fifty-four creatives? Check the list out here. And if you STILL don’t know what The 27 Club refers to, then ask the Googles (or Wiki).